It isn't long before Ben is Zan's favorite, and Ben starts to see Zan as more than just an experiment. His father disagrees. To him, Zan is only a specimen, no more, no less. And this is going to have consequences. Soon Ben is forced to make a critical choice between what he is told to believe and what he knows to be true -- between obeying his father or protecting his brother from an unimaginable fate. Foodie Bibliophile: Having read your Silverwing series, I know that writing about animals is not new territory for you, but Silverwing was a fantasy and Half Brother is a realistic fiction. What inspired you to write about this topic? 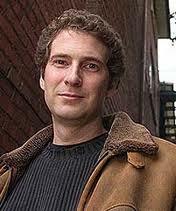 Kenneth Oppel: Half Brother was inspired by a couple of famous experiments that took place in the early 1970’s, in which scientists tried to teach chimpanzees sign language: Project Nim and Project Washoe. The experiments were very controversial –their results are still disputed to this day – and when Project Nim ended after two years, Nim was abruptly stripped of his human identity, his clothes and toys and favourite foods, separated from the people he’d come to think of as mothers and fathers and siblings, and shipped off to another primate research institute where no one understood the signs he’d learned. I thought it was an incredibly sad story. FB: What type of research process was involved in writing a novel about chimpanzees and language acquisition? KO: I read as much as I could about the two real chimp experiments in the 1970’s: Project Nim and Project Washoe. Often, the people who were involved in these experiments went on to write books about their experiences – and their stories are fascinating. In some ways, the events are much stranger than anything I could invent from my imagination! I wanted to know as much as possible about baby chimps, and how they were raised both in the wild, and by humans. I learned a little sign language. I watched films about chimpanzees and how they’ve been used and abused by humans for the purposes of human advancement, like the NASA space program, or for drug testing. I visited a chimpanzee sanctuary outside Montreal called the Fauna Foundation, which is a wonderful home for chimps who were once used in biomedical experiments, or in the entertainment industry, and became too old or ill to be of any further “use” to their human hosts. FB: One of the things that struck me about Half Brother was how the reader gets so emotionally involved in the story from the very first chapter. The relationship between Zan and Ben was so touching. Was this something you had to consciously figure out, or did it flow naturally from the beginning? KO: I found it a very emotional story to write, in part because I chose to set the story in the place and (rough) time period of my own childhood. So though Ben is not really much like me, I certainly drew from some aspects of myself when creating him. That, in combination with just how innately emotional the subject matter is, made for a very intimate, intense story. FB: I loved that you wrote a book on such a volatile topic but didn’t forcefully spew a specific ideology down the reader’s throat. You appeared to address many different points-of-view in a neutral, "I want the reader to think for himself" sort of tone. Having said that, what were you hoping to get across to the reader in this book and what are you hoping readers will take away from reading it? KO: Certainly I was interested in the controversial animal rights issues inherent in the story –but equally fascinating to me were the human dynamics of the story. Imagine, as a teenager, being told to treat a chimp like a baby brother, while never forgetting that it was also a lab specimen. Imagine watching your mother and father indulge in a bizarre form of parenting – one in which the baby was nurtured, but also emotionally manipulated, and ultimately coerced into performing. To the father, the baby is only of value as long as it gives him what he needs. But is human parenting -- or human relationships in general -- so very different? The more I worked on Half Brother, the more it seemed to me the story was really about love in all its possible forms – how and why we decide to bestow it, or withdraw it; how we decide what is more worthy of being loved, and what is less. We are masters of conditional love. FB: I read on your website that you majored in English and cinema studies. Is that academic background what has helped make your novels feel so cinematic? I feel like the books of yours that I’ve read would translate so well on the big screen (Silverwing I think would make a fantastic animated feature). KO: My story-telling style was probably formed long before I went to university, by a mixture of my favourite authors (Roald Dahl first and foremost) and my favorite movies (Star Wars, Jaws, Raiders of the Lost Ark, Blade Runner). When I write, I really do approach the story visually in that I imagine distinct scenes, and my job is to be lighting designer, set designer, choreographer, sound designer, writer and director all rolled into one! It’s quite exhausting. FB: Do you have any interesting or quirky writing habits? KO: Not really. I have a shamefully short attention span, so am easily distracted by the current weather conditions in Cairo, or how much money Iron Man II made domestically, or other unimportant bits of Internet destritus. I listen to music when I write and since I’ve never really listened to lyrics, it doesn’t get in my way. FB: Who is your favorite character in all the books you’ve written? Which of your characters is most like you? KO: Kate de Vries is a personal favourite. Most like me? Well, there’s a bit of me in each and every one, but I’ll let you wonder about which parts. I would like to thank Kenneth Oppel for stopping by A Foodie Bibliophile in Wanderlust. 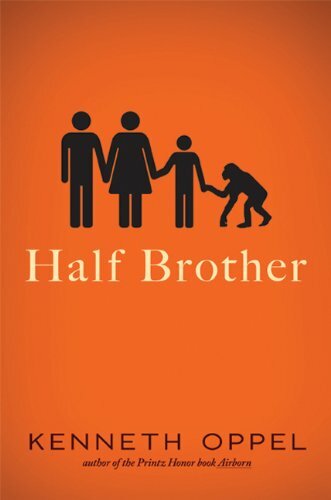 Half Brother was by far one of the best books of 2010 so go out and get it if you haven't read it!